CJC offers its students many student and professional organizations. For more information on these organizations, click on the organization title. You can also contact Katrice Graham, director, Knight Division for Scholarships, Career Services and Multicultural Affairs. The UF Ad Society (ADS) is a professional student advertising organization and college chapter affiliate of the American Advertising Federation (AAF). Its members participate each year in the AAF National Student Advertising Competition. Public Relations students run Alpha PRoductions, Florida’s largest student-run public relations firm. As a division of the University of Florida’s Public Relations Student Society of America chapter, Alpha PRoductions has more than 40 associates who work to perfect campaigns for seven to 10 clients every semester. Clients have included Levi’s, STEM Florida and Tioga Dental. AWSM@Florida is UF’s collegiate chapter of the Association for Women in Sports Media. AWSM@Florida hopes to help students get their dream job in sports, whether it’s journalism, public or media relations, advertising, broadcast or anything in between. AWSM@Florida provides all kinds of resources for students to get involved in the field, such as speakers, events and networking opportunities with fellow sports-loving students and media professionals. For more information, contact Eric Esterline. ChomPics is our national award-winning production group. An offshoot of National Broadcasting Society, students in ChomPics have produced a variety of comedy, dramatic, and entertainment news programs. CMA EDU is a campus-based program that gathers college students in celebration of their love for music and gives them an inside look into the music industry. In return, CMA leverages these groups for research, marketing, and promotional use on their respective campuses. For more information, contact Rob Harder. The Florida Magazine Student Association is a professional organization committed to serving the employment, educational and social needs of UF students interested in pursing a career in magazine writing, editing, designing and/or publishing. FMSA connects its members to editors of local and national publications and to the faculty from the College of Journalism and Communications. Members have the opportunity to take part in resume critique workshops every semester, listen to inspiring guest speakers and gain a greater knowledge of the magazine world. We are also a chapter of Ed2010, a community of young, eager magazine editors and magazine-editor wannabes who want to learn more about the industry and obtain editing positions. For more information, contact Ted Spiker. GSMCA is a student run organization in the College of Journalism and Communications. It serves as the liaison between the College of Journalism of Mass Communication, the Graduate Student Council and the graduate students. The association’s primary purpose is to assist, advise, and inform incoming and currently enrolled graduate students about the program, the university, and living in Gainesville. Hatch is charged with driving real-world experimentation at the intersection of storytelling, narrative science and social good across all four of the College’s disciplines – advertising, journalism, public relations and telecommunication. Hatch’s educational mission is to present applied experience for CJC students in nimble and user-focused product and project management, increasingly important skills for communicators. Teams of students, from the College as well as other disciplines within the University, will form and reform into product development work groups. For more information, contact Matt Sheehan. HCA was founded in 1992. Its membership encompasses students from all college majors. Based on total Hispanic enrollment, HCA has the highest percentage of participation of any of the college’s minority student media organizations. Journalism & Communications Ambassadors are dedicated to promoting high standards of excellence in the University of Florida’s College of Journalism & Communications by giving all students access to opportunities for both academic and personal development. Kappa Tau Alpha is a college honor society that recognizes academic excellence and promotes scholarship in journalism and mass communication. Membership must be earned by excellence in academic work. Selection for membership is a mark of highest distinction and honor. Founded in the fall semester of 2012, the purpose of the Media and Society Club is to service students who are intrigued by all aspects of the media. We will provide a forum for students to discuss the media’s societal impact and teach students how to leverage social media for professional use. Through seminars activities, and guest speakers, we aim to help students stay on top of the latest digital trends so that they are better equipped to lead a career in the fields of social media, digital media, and other traditional forms of media. The Gator Chapter of the National Association of Black Journalists, formerly known as the Association of Black Communicators, was founded in 1980 as the first minority organization in the University of Florida’s College of Journalism and Communications. The name was changed in 2012 to reflect its relationship with the National Association of Black Journalists the professional parent organization. In its 32 years of excellence, it has promoted and encouraged journalism and communications as a career for students while gaining operational support from the college’s Knight Division. Alpha Epsilon Rho is a highly visible national honor society for students in all areas of electronic mass media. The University of Florida has had is one of the oldest and traditionally one of the largest and most active in NBS-AERho. The local chapter has sponsored guest speakers and career workshops, helped with the Department’s Advisory Council activities, and sent large delegations to regional and national NBS-AERho conventions. The National Press Photographers Association is dedicated to the advancement of photojournalism, its creation, editing and distribution, in all news media. NPPA encourages photojournalists to reflect high standards of quality in their professional performance and in their personal code of ethics. NPPA vigorously promotes freedom of the press in all its forms. To this end, NPPA provides continuing educational programs and fraternalism without bias, as we support and acknowledge the best the profession has to offer. Our members include still and television photographers, editors, students and representatives of businesses that serve the photojournalism industry. The Public Relations Student Society of America is one of the most prestigious organizations at the University of Florida and one of the strongest and largest chapters in the nation. It provides superior pre-professional development that consistently places its members ahead of the competition in today’s fierce job market. RTDNA is a professional organization that has student memberships. RTDNA has a Florida chapter which has annual conferences. The Society of Professional Journalists is the leading national organization of student and professional journalists. Membership is open to all students who intend to embark on a career in media. The national organization is especially active in journalism ethics, freedom of information and cases involving the rights of reporters. The Student Society for News Design (SSND) is an international professional organization with more than 2,500 members worldwide. 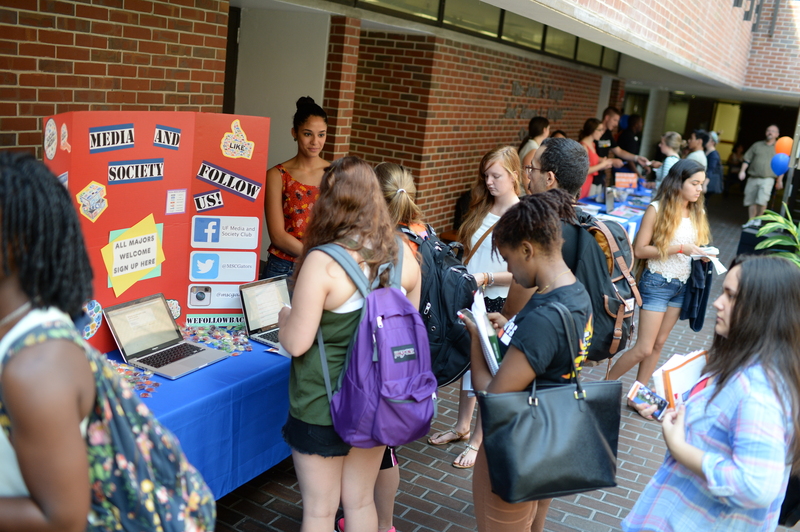 Students are encouraged to join the University of Florida chapter. We host guest speakers who are noted newspaper and magazine designers, art directors, website designers or editors. Students are also encouraged to participate in national design competitions sponsored by the Society and travel to SSND’s workshops and quick courses. All members receive a subscription to Design magazine, a monthly newsletter, and the annual book, The Best of Newspaper Design. Members are also eligible for student mentoring programs and scholarships and are encouraged to seek out design internships.